A gun control ad was recently released that shows a woman victimized by a man with a gun. I know, I know… when you watch the ad, common sense will probably kick in and you’ll be wishing the woman had a gun to defend herself. But, that is a fact that is apparently overlooked by the anti-gun crowd. 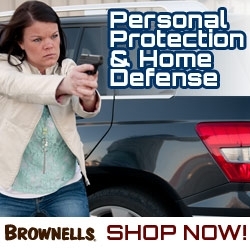 Fortunately, someone with common sense made a similar ad that shows the same scenario, except this time the woman has a gun and is able to defend herself and her child. See… I told you… common sense! Please share this post and help us promote Second Amendment awareness!